The Delta Faucet Company industrial design team skillfully traverses the world and works with top trend spotters to predict and pinpoint emerging style preferences annually. 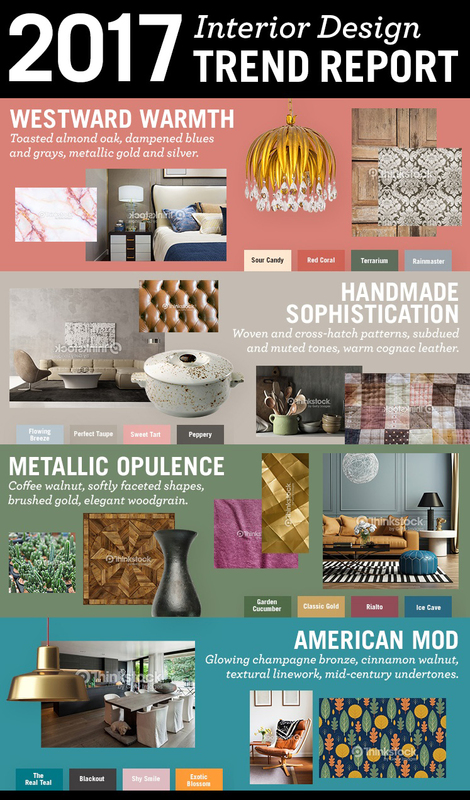 The 2017 interior design trend report accounts for global travels, industry expertise and consumer insights. Together, they result in emerging themes from the juxtaposition of natural materials and opulent ornamentation to minimalistic designs enhanced with bold, new finishes. Westward Warmth: Striving to add playfulness to neutral tones, fall-inspired moody florals, satin gold and toasted almond oak create a classic design environment within open concept spaces. Intentional curves with nailhead accents or flowing fabric coupled with two-toned molding create inviting environments. Homeowners can incorporate luminous white gold silverware into a tablespace, install a spool-shaped light fixture in an airy room or mix marble and brass for a unique coffee table display to further accessorize and leverage this trend. 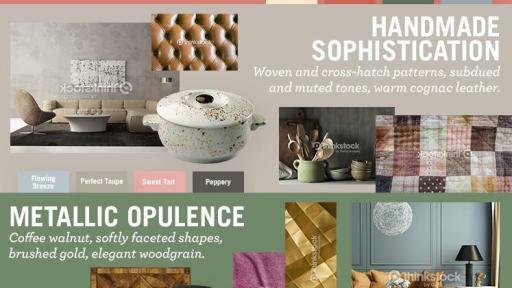 Handmade Sophistication: Geo-quilt patterns, deep earthy colors and metal accents align at the intersection of homemade and high-end chic with this welcoming aesthetic. To create a feeling of laid-back sophistication, this trend balances the rough edges of exposed beams and concrete slab floors with cognac leather and dark pewter finishes. Whether an accent doorknob or a coffee-toned media stand with an industrial frame, the opportunities to incorporate this trend are endless and allow for a look that is both affluent and authentic. Metallic Opulence: Influenced by the Art Deco era, this trend melds one luxurious element after another to deliver a combination of comfort and high-end design. Strong, geometric patterns and dark hues complement softly faceted shapes, matte black accessories and brushed gold finishes. Conversely, metallic accents are balanced with soft textiles in natural greens, strong blues and rosy purples. Coffee and walnut tones juxtapose stone accents for an added touch of elegance to this opulent yet livable design. American Mod: Perforated metal paired with layered shapes and sophisticated metal blocking work to create a streamlined mid-century trend with modern flair. American Mod continues to gain momentum within the design community as it taps into strong Scandinavian influence via a streamlined aesthetic that emphasizes a mix of geometric shapes. Homeowners seeking a flexible balance between suburban and urban living can incorporate angular elements with soft hand leather, modern blacks and semi-transparent glass to accomplish such a look and feel. For additional design inspiration and advice, visit DeltaFaucet.com/inspiredliving. Founded by Masco Corporation in 1954 with the introduction of the single-handle faucet, Delta Faucet Company is proud to be America’s faucet innovation leader, featuring Delta®, Brizo® and Peerless® products. A WaterSense® partner of the U.S. Environmental Protection Agency, Delta Faucet is a global organization that offers kitchen faucets, bath faucets, shower heads, shower systems, toilets and related accessories, selling products in more than 53 countries. For more information, visit www.deltafaucet.com. Headquartered in Taylor, Mich., Masco Corporation is a global leader in the design, manufacture and distribution of branded building products. Our portfolio of industry-leading brands includes Behr® paint; Delta® and Hansgrohe® faucets, bath and shower fixtures; KraftMaid® and Merillat® cabinets; Milgard® windows and doors; and HotSpring® spas. We leverage our powerful brands across product categories, sales channels and geographies to create value for our customers and shareholders. For more information about Masco Corporation, visit masco.com.